Doing and Undergoing is the most recent work in an ongoing series of Choreographic Objects that deploy simple materials to engender isolated classes of bodily motion. The work’s title is a term taken from pragmatist philosopher John Dewey’s writings on aesthetics in his influential book Art as Experience (1934). The object engages with the proposals put forth in Dewey’s book by asking the viewer to physically ‘make’ the work for himor herself as an experience crafted out of precise physical interaction with the object. 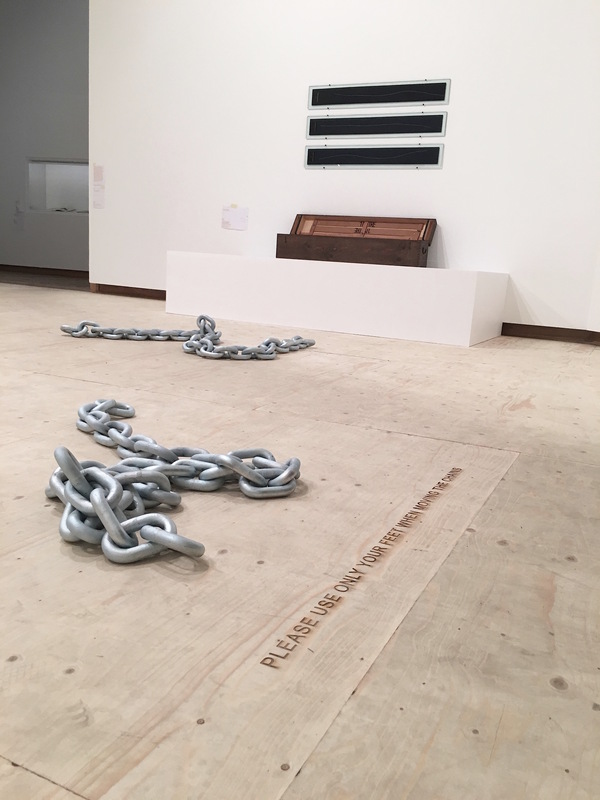 Doing and Undergoing consists of several lengths of heavy steel chain placed on the floor. 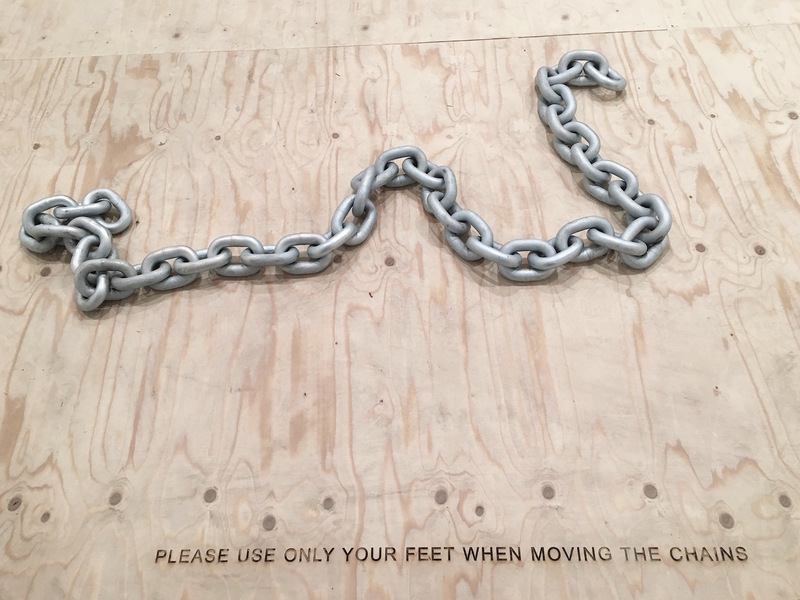 The viewer is invited to arrange the chains at will, but only by moving his or her feet, kept flat on the floor. Most importantly, the resulting arrangement, which may reflect his or her individual aesthetic choices, resides experientially and forcefully in the body of that person actually doing the work. Thus, the given parameters of the work aim to engender specific actions related to inhibited locomotive progression, while inducing a very particular physical experience. To my mind, this method of generating choreographic material finds a procedural antecedent in Marcel Duchamp’s 3 Stoppages Étalon [Three Standard Stoppages] (1913–14). I consider the actions specified by Duchamp for the realization of this work to be the very first instance of a conceptual choreographic act. Our relationship to Three Standard Stoppages is mediated by the knowledge of Duchamp’s procedural actions in the creation of the work: hold a metre of string one metre above the floor and release the string, letting it fall to the floor, apparently preserving the identity of the metre, but no longer as a straight line. Duchamp then rendered these no-longer-straight ‘metres’ as wooden templates for exhibition. The undertaking of this original but ordinary action produced unique, discursive objects. What then comes to my mind is a simple isometric translation that establishes the relationship between these works: specific actions that produce objects versus objects that produce specific actions – the former being Duchamp’s, the latter my own.